New legislation from the Trudeau Liberal government is threatening the pensions of Canadian workers. 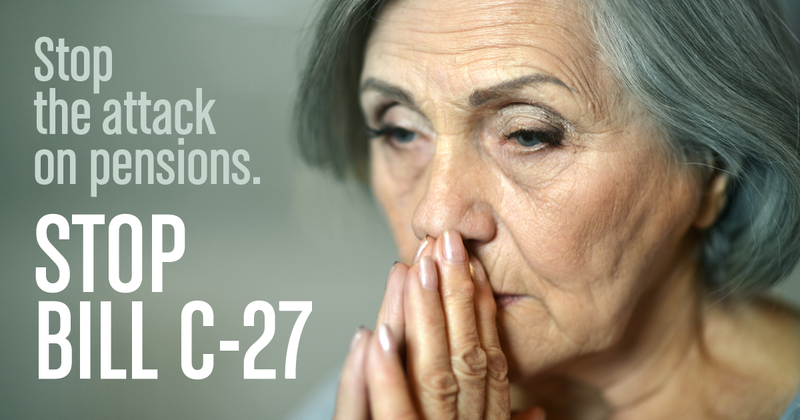 Bill C-27 is an attack on good defined benefit pensions that could allow employers to break their pension promises to thousands of workers and retirees across the country. “CUPE is strongly opposed to Bill C-27, and we are urging the federal government to stop this short-sighted and ill-conceived attack on the retirement security of Canadian workers,” said Mark Hancock, national president of CUPE. Bill C-27 will allow federally-regulated employers to retroactively change a defined benefit pension promise into insecure “target benefits” by pressuring workers and retirees into surrendering benefit promises they have already earned. Converting defined benefit pensions to a target benefit model shifts virtually all risk onto workers and retirees. Bill C-27 could essentially allow employers to walk away from pension commitments to their workers, and leave thousands of Canadians abandoned in retirement. While Bill C-27 only applies to federally regulated employers, CUPE warns that if it is passed into law it will set a dangerous precedent for other jurisdictions, and put more pressure on defined benefit pension plans.